Canon has launched a pair of ultra-compact network scanners the Canon imageFORMULA ScanFront 300e and 300eP. The small format scanners – they're just 310mm (W) x 161mm (D) x 215mm (H) and weigh 3.5Kg - are designed to work as a shared scanning device for office teams, at customer service points or remote branch offices, and both scanners can be managed and administrated centrally on a network, reducing IT costs and time. The scanners come with Canon's eCopy ShareScan software which enables business users to grab text from any document using Optical Character Recognition (OCR) software and to then distribute the data into programmes such as Microsoft Word or Excel, and business information systems including SharePoint, OpenText DM, EMC Documentum, and iManage Worksite. The ScanFront 300e and 300eP have an ultra-compact sleek design and can be conveniently placed in offices with limited space. The robust feeder mechanism and straight-through paper path enables various document types and thicknesses to be scanned reliably together. With a feeding capacity of up to 50 sheets, they allow fast batch scanning of up to 27 pages per minute (ppm). The devices also feature large 8.4" colour touch screen enables users to operate the device with ease and navigate through menus quickly. In addition, the ScanFront 300eP model comes with Ultrasonic Double Feed Detection, ensuring all documents are scanned smoothly, and with advanced security measures thanks to a built in fingerprint sensor that enables instantaneous user authentication. 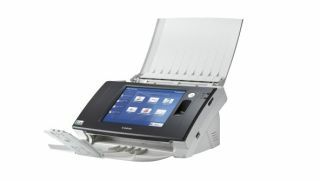 The ScanFront 300e/300eP models can be connected and managed by eCopy Sharescan Manager on the same common network with other eCopy enabled devices, including Canon's standalone USB scanners and multi-functional devices. The ScanFront 300e/300eP will be available through all Canon sales offices and selected distributor partners across Europe from beginning June, 2012. The eCopy ShareScan Software packages will also be available separately to the ScanFront 300 and 300eP devices.